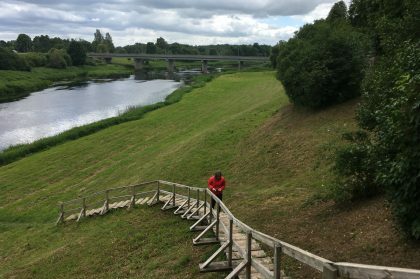 The overall objective of the UniGreen project is to facilitate sustainable tourism development in border regions of Latvia and Lithuania by stabilizing and increasing of the number of visitors and number of overnight stays. (3) supporting local business and development of qualitative living and working environment for different social groups, including persons with disabilities on an equal level. UniGreen focuses on development of new tourism products and their promotion. he expected result of the project is the identification of the project territory as joint destination for incoming tourism and network of nature-based one-day destinations for the local market. 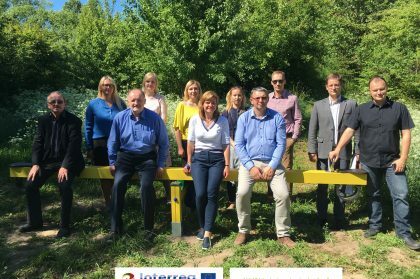 Over the 2,5 years’ project implementation period (05.2017-10.2019) in Kurzeme and the border regions of Lithuania it is foreseen to build 7 walking trails equipped with various edutainment elements, 2 resting areas, 2 playgrounds and an adventure park for children, 2 watching towers, a viewing platform, 4 pontoon piers and 3 pontoon bridges, develop the Trail Guidebook with more than 80 trails in Kurzeme and North Lithuania, install audio solutions at 21 nature object adapted for people with eyesight problems, organise the training of nature guides in Latvia and Lithuania, as well as carry out other activities for the development of nature tourism and facilitation of the accessibility of nature objects. The overall financing of the project is 1 176 867,14 EUR, i.a. ERAF financing 1 000 337,07 EUR. The uniqueness of the project is to develop the accessibility to nature objects for travelers with disabilities. 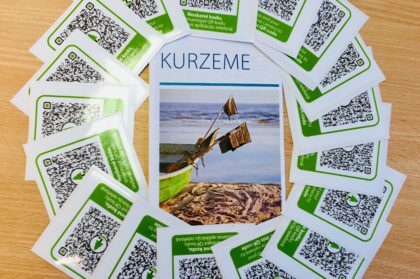 To increase the nature accessibility, Kurzeme Planning Region has recorded trail descriptions for 20 nature sites in whole Kurzeme in LV and ENG languages to inform the visitors on trail distance, objects of interest, access options etc. 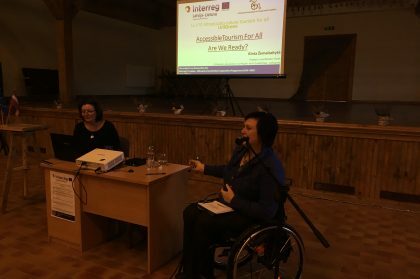 To enhance the understanding, skills and knowledge of municipalities, entrepreneurs and other administrators of nature territories on accesibility and provision of tourism products and services, Kurzeme Planning Region together with the organisation “Apeirons” has developed an illustrative and practical material on how to adapt the tourism infrastructure, products and services for people with disabilities. 26 Kurzeme nature guides have successfully finished the nature guides’ training course and received certificates by Kurzeme Planning Region and the Nature Guides’ Association of Latvia. On 22-24 November the final – sixth Kurzeme nature guides’ training session took place in Pope, Ventspils County. The key topic of the session was the promotion of nature events and organisation of nature interpretation exhibitions. Nature guides presented their homeworks on designing tourism brochures and guiding self-developed excursions. During the session, the guides also worked on practical tasks in groups to design their vision on a new nature exhibition to be installed at Roja Sea Fishing Museum. 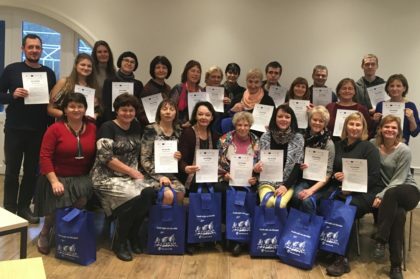 In the end of the session the 26 nature guides who successfully finished the training course received certificates issued by Kurzeme Planning Region and the Nature Guides’ Association of Latvia. The course participants admitted that the course has been extremely important both, because of the comprehensive training content targeted to enhance the theoretical knowledge on nature interpretation, as well as to develop the practical skills allowing to step out of one’s ordinary routine and stimulate the hidden talents, imagination and ideas. The most valuable result, undoubtedly, is the group of the guides itself, which have all became good friends and have already started to cooperate, discuss topical tourism issues, exchange views and continue networking already beyond the scope of this project. We are really grateful both, for the contribution of the lecturers and dedication of the guides and wish many, many achievements in their further work in applying the knowledge and skills acquired during the course to improve their excursions and to develop new and creative nature tourism products. 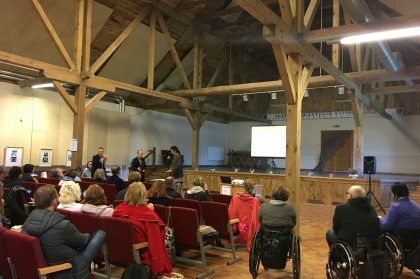 The training has been organised by Kurzeme Planning Region in cooperation with the Nature Guides’ Association of Latvia as part of the UniGreen project No. 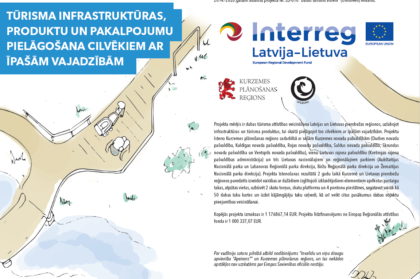 LLI-010 under the Interreg Latvia-Lithuania Cross-border Cooperation Programme 2014-2020. 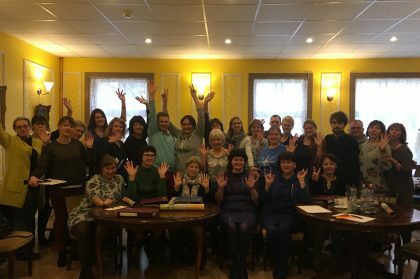 The training ran from October 2017 till November 2018 with 6 training sessions (each 3 days long) in Kurzeme and a practical training visit to Lithuania (2 days). The overall length of the training programme was 160 hours. Nature guides’ training goes on! The selected nature guides’ training group continues it’s training. 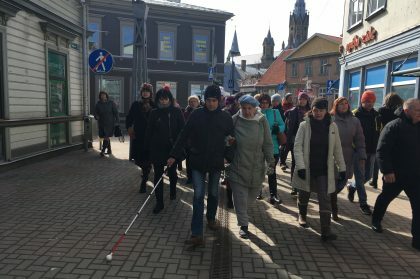 The guides met on 18-20 January in Dundaga to participate at the second training session and on 22-24 March in Liepāja to hold it’s third training session already. 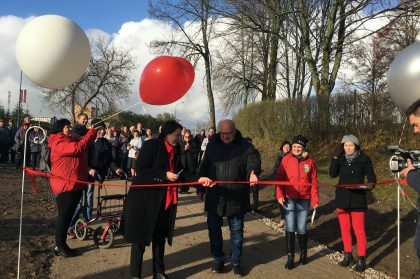 Last week, on 10 November, with a solemn event and symbolic ribbon-cutting, the new walking trail in Skrunda was opened, and the nature guides’ training launched, with a first three-days training session in Kuldīga. Pagājšnedēļ, 10.novembrī, ar svinīgu pasākumu un lentas griešanu tika atklāta jaunā pastaigu taka Skrundā un uzsāktas vides gidu apmācības, ar pirmo trīs dienu apmācību sesiju Kuldīgā. Thanks to nature diversity, landscapes, clean and safe environment, the border regions of Latvia and Lithuania inhere good potential for the development of nature toursim. In order to use it for fostering the development of boder regions, including the development of entrepreneurship, this year in May the Kurzeme Planning Region in cooperation with seven municipalities of Kurzeme region and Lithuania and three national and regional parks of Lithuania has commenced a project for the development of sustainable tourism in Kurzeme and the border regions of Lithuania to increase the number of visitors and overnight stays in regions. 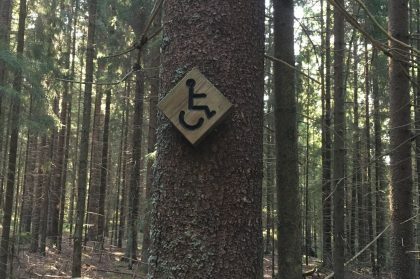 On 19-20 October 2017 in Lithuania, at the Plateliai Culture Center, UniGreen organises the Conference “Accessible Nature Tourism”. Dėl gamtinės įvairovės, kraštovaizdžio, švarios ir saugios aplinkos, Latvijos ir Lietuvos pasienio regionai turi palankų potencialą gamtinio tourizmo plėtrai. Norint jį išnaudoti skatinant pasienio regionų plėtrą, įskaitant verslumo plėtrą, šių metų gegužės menėsį Kuržemės planavimo regionas Latvijoje, bendradarbiaudamas su septyniomis savivaldybės iš Kuržemės regiono ir Lietuvos, ir trimis nacionaliniais ir regioniniais parkais Lietuvoje pradėjo vykdyti projektą, skirtą plėtoti tvarų turizmą Latvijos ir Lietuvos pasienio regionuose, siekiant padidinti lankytojų ir apsistojančių nakvynei skaičių regionuose.